Thank you to everyone that participated in the contest and shared our Kickstarter project with others. 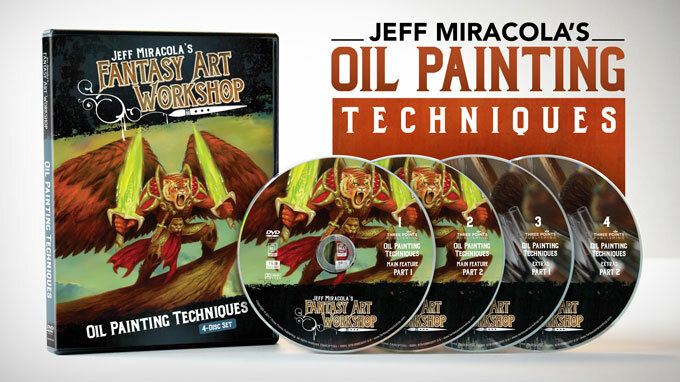 To raise awareness of Jeff Miracola’s Fantasy Art Workshop Oil Painting Techniques Kickstarter Campaign, Three Points Publishing is giving away a FREE one (1) hour live chat session with Fantasy Artist Jeff Miracola. This is your opportunity to have a one-on-one online video chat with a professional fantasy artist. Ask Jeff any questions you like about art, art techniques, the art business, and more. Jeff will happily look at your art work or portfolio and give you feedback, too. The contest is now closed. Thank you to everyone that participated. Eligibility: This Campaign is open to Anyone in the world 18 years of age or older. Employees of Three Points Publishing, its affiliates, subsidiaries, advertising and promotion agencies, and suppliers, (collectively the “Employees”), and immediate family members and/or those living in the same household of Employees are not eligible to participate in the Campaign. The Campaign is subject to all applicable federal, state, and local laws and regulations. Void where prohibited. Agreement to Rules: By participating, the Contestant (“You”) agree to be fully unconditionally bound by these Rules, and You represent and warrant that You meet the eligibility requirements. In addition, You agree to accept the decisions of Three Points Publishing as final and binding as it relates to the content of this Campaign. Campaign Period: The Sweepstakes will start Sunday, November 13, 2016 at 9:30pm (Central Standard Time) and end Saturday, November 19, 2016 at 11:59pm (Central Standard Time). Prize: The Winner of the campaign will receive a one (1) hour Skype session with Fantasy Artist Jeff Miracola which will take place sometime between December 6, 2016, and May 6, 2017. Winner must have access to a computer and Internet connection as well as a Skype account in order to connect with Jeff Miracola to participate in the Skype session. Three Points Publishing and the Winner will work to establish the most convenient time and date for both parties to participate in the Skype session. Jeff Miracola and Three Points Publishing reserve the right to cancel, terminate, modify or suspend the Skype session at any time. Odds: The odds of winning depend on the number of eligible Contestants. Winner Selection and Notification: Winner will be selected by a random drawing under the supervision of Three Points Publishing on Sunday, November 20, 2016 at 1:00pm (Central Standard Time). Winner will be notified via Facebook messaging by Jeff Miracola. Winner’s name (First name, Last initial) or Facebook username will be listed on this Sweepstakes page on Sunday, November 20, 2016 at 1:00pm (Central Standard Time). Terms & Conditions: Three Points Publishing reserves the right, in its sole discretion, to cancel, terminate, modify or suspend the Campaign should virus, bug, non-authorized human intervention, fraud, or other cause beyond Three Points Publishing’s control corrupt or affect the administration, security, fairness, or proper conduct of the Campaign. In such case, Three Points Publishing may select the Winner from all eligible entries received prior to and/or after (if appropriate) the action taken by Three Points Publishing. Three Points Publishing reserves the right, in its sole discretion, to disqualify any individual who tampers or attempts to tamper with the entry process or the operation of the Campaign or website or violates these Terms & Conditions. Three Points Publishing has the right, in its sole discretion, to maintain the integrity of the Campaign, to void entries for any reason, including, but not limited to: multiple entries from the same user from different IP addresses; multiple entries from the same computer in excess of that allowed by Campaign rules; or the use of bots, macros, scripts, or other technical means for entering. Any attempt by an entrant to deliberately damage any website or undermine the legitimate operation of the Campaign may be a violation of criminal and civil laws. Should such attempt be made, Three Points Publishing reserves the right to seek damages to the fullest extent permitted by law. Sponsor: The Sponsor of the Campaign is Three Points Publishing, PO Box 210861, Milwaukee, WI 53221, United States. Facebook: The Campaign hosted by Three Points Publishing is in no way sponsored, endorsed, administered by, or associated with Facebook. Skype: The Campaign hosted by Three Points Publishing is in no way sponsored, endorsed, administered by, or associated with Skype.